Industrial Bearing Wholesalers Online Shop can provide CO and CQ that apply for the Certificate for Chamber of commerce when arrange goods for you if you need. And bearing quality is for one year. We also can provide non-standard bearings if you need. Non-standard bearings, popular speaking, is not in line with national standards of the size of the bearing, that is, the size of the national standard is different from all the bearings. The main features are low versatility, mostly special equipment, special occasions, small batch, new research and development equipment trial products accounted for the majority; but because of its non-scale, mass production, production enterprises and not much, the cost is high , The price is more expensive. Standard bearing diameter or outside diameter, width (height), size in line with GB / T 273.1-2003, GB / T 273.2-1998, GB / T 273.3-1999 or other relevant standards of bearing size. All items are fully guaranteed. Some manufacturers warranties may vary. We will either replace, refund or extend full credit for any defective items returned within 30 days of purchase. All merchandise should be inspected upon receipt. Please advise us promptly upon discovering any defect. To facilitate the issuance of credit, ensure you send the Return Paperwork issued by our company with your returned products. Follow return procedure. *NOTE: Any modification of product voids guarantee. Issued By: NSK Canada Inc. Issued By: THK America Inc. Issued By: IKO Isolations B.V. 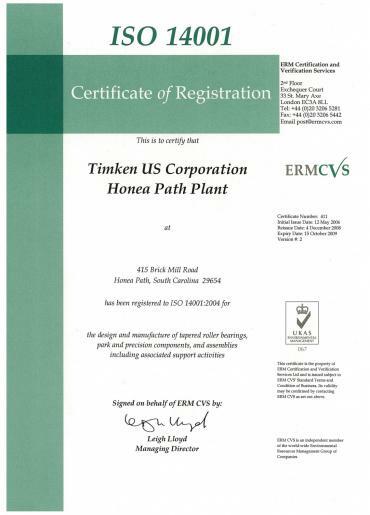 Issued By: TIMKEN ROMANIA S.A. I want to buy Mud pump bearings product you are selling, please contact me !